The judge presiding over the murder case of suspended Chicago Police Department Officer Jason Van Dyke says a trial will be held this summer, more than two years after charges were first filed in the shooting death of teen Laquan McDonald. “I’m not going to say a specific month, but it will be this summer,” Cook County Circuit Court Judge Vincent Gaughan said during a hearing Wednesday morning. The judge stated he doesn’t want inclement winter weather creating travel issues during the trial or affecting juror availability. Van Dyke was first charged in late 2015, more than a year after the shooting death of 17-year-old McDonald. Court officials have said they’ll need up to 10 weeks’ notice to properly prepare dozens of juror subpoenas, an overflow courtroom and court security for the case. Van Dyke’s defense attorneys on Wednesday also filed a motion to change the venue of the trial, believing the high-profile nature of the case could negatively impact their ability to conduct a fair trial before a Cook County jury. If granted, it could mean the trial is moved to another county, or jurors from another county are brought in for a trial in Chicago. The attorneys hired a California-based polling specialist earlier this year to survey hundreds of residents across three Illinois counties in support of that request. The results of that polling haven’t yet been finalized, but Gaughan ordered Van Dyke’s attorneys to produce either the data itself or the specialist to testify next month. Van Dyke has pleaded not guilty to first-degree murder. Sixteen additional charges of aggravated battery have since been added, one for each bullet Van Dyke allegedly fired at McDonald. The case garnered widespread attention following the release of dashcam footage of the shooting. Attorneys at Wednesday’s hearing also discussed a request by Chicago Public Media representatives to grant public access to sealed documents currently held under a “decorum order” in the high-profile murder case. That order prohibits attorneys from discussing any details in public outside the courtroom, which the judge says is necessary to ensure a fair trial. The public media attorneys sought to review the full case file in the confines of Gaughan’s chambers, but the judge denied that request. He has repeatedly pointed to the balancing act necessary between public transparency and Van Dyke’s right to a fair trial, telling attorneys they’ll have an opportunity to argue about what should be released next month. All parties are due back in court for a hearing April 18. March 8: In 2015, Chicago Police Officer Jason Van Dyke pleaded not guilty in the fatal shooting of Laquan McDonald. But a start date for the trial is likely still months away. Dec. 6: Should Jamie Kalven, the reporter who broke the story of the Laquan McDonald shooting, be forced, under oath, to reveal his sources? 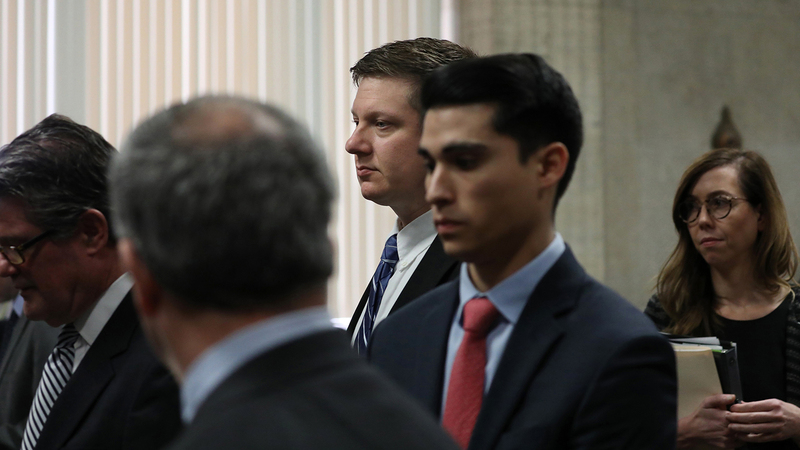 July 10: Two former Chicago Police officers and one current officer pleaded not guilty to charges they conspired to cover for former cop Jason Van Dyke in the shooting of 16-year old Laquan McDonald.